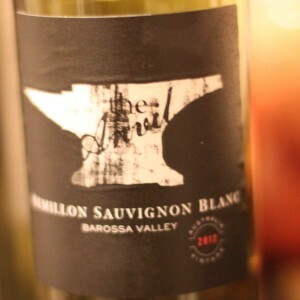 This Anvil Semillon Sauvignon Blanc from Virgin Wines put me in mind of Spinal Tap. There’s something about the name and label that screamed bad rock band. Maybe that’s just me. Once past the label it’s time to think of the wine. I didn’t hold out a lot of hope for a Semillon Sauvignon blend. I tend to think of Semillon as a wine to cook with. Opening it up I was immediately hit with a bright, fresh smell. The wine is pale and uninteresting, but with quite an intense aroma of lemons and gooseberries. It is just off dry with a medium acidity, and a medium low level of alcohol. Ordinarily I’d think – meh – it’ll be insipid, but that lemon-gooseberry smell was enhanced by some extra fruit flavour. Nothing really specific like pineapple or mango, but more of a Fruit Salad flavour. If you remember the little pink and orange Fruit Salad sweets that came with Black Jack liquorice ones then you’ll be pretty close. Luckily for me I love Fruit Salad sweets so this wine worked great for me. It was lighter in alcohol than you might expect from Australia, so it’s fruity gluggability isn’t too overwhelming.